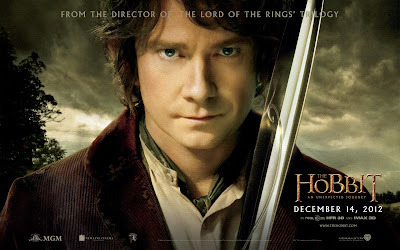 Bilbo Baggins (Martin Freeman) is happily enjoying a standard day in his standard life as a hobbit, that is until an unusual encounter with Gandalf the Grey (Ian McKellen), a wizard who soon convinces him to embark on a dangerous quest with thirteen dwarves. The aim of this adventure is to enter the Lonely Mountain and different the dragon Smaug in order to reclaim their home, previously destroyed by said dragon. However, with the majority of the dwarves against Bilbo's involvement, and a range of other creatures such as trolls, elves and orcs, this quest proves more difficult than Bilbo ever imagined. As a prequel to what is widely considered, and rightly so, one of the greatest trilogies ever made for the big screen, An Unexpected Journey has its work cut out from the offset. Thankfully, the film is a roaring success. Given, it's nowhere near the same level as the Lord of the Rings series, or even its opener The Fellowship of the Ring, for that matter, but on the whole An Unexpected Journey proved to be a far better film than I imagined it to be. Opening to a relatively lukewarm reception from critics, with accurate complaints against its pacing and unforgivable runtime, can't have been an easy blow, but with a sequel now out that has claimed as far superior, there appears to be a vast amount of hope for The Hobbit trilogy. To look at, this film is incredible. Back in the early 2000s, The Lord of the Rings was visually spectacular, and those effects even hold up today, which is not something you see often. Because of this, An Unexpected Journey had even more pressure to be visually impressive, and it exceeds these expectations with ease. Yeah, there is some dodgy green-screening here and there, but for the most part the effects are extraordinary. Whether we're presented with stunning backdrops, smouldering dragons or spectacular battles, An Expected Journey is never dull to look at. A common complaint against this film is the length of its opening. Here, I disagree. Yeah, the introduction could have been shorter and we didn't really need half an hour of dwarves being messy and Bilbo throwing tantrums, but it was never boring; not once did I find myself checking the time to see how long was left. Where the film does falter is its relentless change of locations and ridiculously overlong running time. Towards the beginning of the second act, we randomly cut to another Wizard that we've only heard of once. Once explained, it makes perfect sense. But in the moment, it takes a touch of magic in itself to understand what on (Middle) Earth is going on. But, when the film reaches it's final act, and the action is vamped up, An Unexpected Journey truly soars. A simply fantastic scene involving Andy Serkis' Golem is an undeniably highlight, and very high up there with the best Lord of the Rings scenes ever. A fantastic chase/battle sequence in an intentionally confusing yet brilliantly designed home for the Goblins is also an exceptional scene. Due to the vast increase in technology and what we can do with computers in film now, even if The Hobbit never surpasses Lord of the Rings in terms of storytelling and character development, it seems very likely to fly past with it's action sequences. With a near 170 minutes runtime, The Hobbit: An Unexpected Journey is not really a light hearted watch. But, it's always an interesting one, and one you'll definitely want to go back and revisit. It may not be up there with Lord of the Rings just yet, but with two sequels to follow, I wouldn't be surprised if this standard is reached. The effects are just outstanding, it's well written and acted, and it boasts some truly incredible set pieces and action sequences. Sure, it's not perfect, and it's still rough around the edges but this was never going to be a straight forward film. Give it your interest, and your time, and An Unexpected Journey is an adventure that's hard not to love. To Summarise: It's relentlessly overlong and may not live up to the standard of its sister-series, but The Hobbit: An Unexpected Journey is visually mind-blowing, with story, characters and emotional power to live up to it.